The early solar system was likely a chaotic place - something which I suspect few disagree. When examining the merits of Zecharia Sitchin's account of what happened, one of the crucial issues is the initial position of the primordial Earth. He claimed, through his examination of ancient Mesopotamian texts, that the earth Earth was a watery world, much bigger than today's familiar planet, and that it was located early on where the asteroid belt is now - between Mars and Jupiter (1). The ancient Babylonians gave this watery world the name 'Tiamat', a key player in their myth of creation, the Enuma Elish (2). The planet already had a companion at the point when the usurper god/planet Marduk came onto the scene. That companion, named Kingu, was the Moon. If we are to verify (or discount) Sitchin's account, then it is important to examine evidence about the early Earth's location, and what science can tell us about the catastrophic events which took place during the first billion years of its life. It appears that about 4.5 billion years ago, the early Earth was struck by a Mars-sized body, an event which lead to the formation of our Moon from the resultant debris. Then, 3.9 billion years ago, the entire inner solar system was subjected to a long-term bombardment of massive celestial objects, causing the scarring and cratering we observe across the surfaces of terrestrial worlds like Mars, Mercury and the Moon (the same is no doubt true of Venus, and the Earth, but both of their surfaces have undergone significant reshaping over time, masking the violent effects of those early events). A new study of meteorites known to have originated from the asteroid belt has provided new evidence that the Moon-formation event left its mark upon the asteroids (3). "For the first time, the mainstream has CONFIRMED that the main asteroid belt contains the remnants of a collision with Earth/Tiamat. Previous probes have confirmed earthly minerals and volatiles on asteroids in the belt, rather than the exotic primordial materials that were expected. "The article says: "It would have produced a lot of debris that would have been thrown completely out of the Earth-moon system (5)." But, I say that it was the Earth-moon system that was thrown out of the Mars-Jupiter location of the asteroid belt! The final analysis is probably that there were two major collisions during the formative years of the Earth-moon system, probably caused BY THE SAME DARK STAR BODY AND RETINUE PASSING. 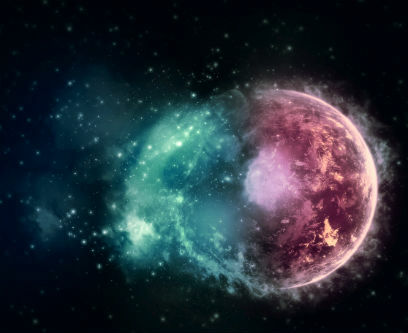 The first created the Tiamat/Earth-Moon system, while the second one reduced Tiamat to the size we see today as Earth. The second one also scarred the previously-existing Moon (mostly on one side) as we see today. I would add that the model, as presented by the scientists who have undertaken this study, presumes a status quo in the solar system which is highly arguably. They are assuming that at the time of the Moon-formation event (4.47 billion years ago), the asteroid belt was essentially as it is today. Given that we still don't really truly understand the mechanics of how planets form, we should perhaps be cautious about assuming that the asteroid belt was in place just 100 million years after the birth of the Sun. More likely, this zone was still a mutating part of the swirling primordial disk, within which primordial planets were forming (like the early Earth and whatever struck it). It seems far more likely to me, therefore, that for the asteroids to be intimately connected with a bombarded Earth so early on, a conclusion can be drawn that the asteroids, too, were created from the same event. That could only be true if the Earth began life where the asteroid belt is today. This creates some questions for the Sitchinite model. If the Moon (Kingu) was already a moon of the early Earth (Tiamat) when the Dark Star (Nibiru/Marduk) appeared on the scene, then it follows that the asteroid belt was also already in place. 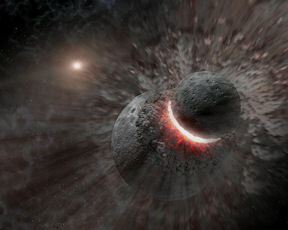 So any interaction between the Earth/Moon system and the Dark Star system (Sitchin's 'Celestial Battle', which likely took place during the late, heavy bombardment 3.9 billion years ago), simply led to the migration of the Earth/Moon system (as well as some accompanying bombardment at that time) to where it is today - leaving the asteroid belt behind. For me, this actually makes more sense than the Earth/Moon system migrating at the same time as the asteroid belt formation. However, in this respect, it doesn't comply so well with Sitchin's account, based upon the ancient Mesopotamian texts (1). Based upon the scientific evidence, the later impact which plunged the Earth/Moon system inwards must have occurred when the asteroid belt was already in existence. Or, alternatively, all of these events occurred at the same time, now reliably confirmed as 4.47 billion years ago. Last month, I delved into a discussion about Dark Matter stars which was, to be fair, very much 'out of left field' (1). It was based upon the theoretical work of Dr Vladimir Netchitailo, a physicist specialising in lasers, who had produced a revolutionary discussion paper about the distribution of Dark Matter in the universe, and who said Dark Matter might actually concentrate in particularly dense areas, like galactic cores...and even within individual stars (2). I have to say that even as I was writing it, I felt that on a fairly major level it was unworkable, as most physicists consider Dark Matter to be highly energetic in nature, hence difficult to detect. But as there is as yet little empirical evidence from Dark Matter to inform us of its properties, most of this discussion is merely theoretical, so who knows? Perhaps Dark Matter offers us some new possibilities that aren't simply going to be confined to high-end particle physics. This is at odds with Dr Netchitailo's proposals, which instead seem to concentrate the Dark Matter in the centre of the galaxies (2). Dr Cappellari wonders whether the observed effect of equal rotational speeds of stars across these galaxies might actually be due to Newton's law of gravity becoming progressively less accurate at large distances (3), rather than the existence of Dark Matter. So, either Dark Matter is distributed to the outskirts of galaxies, driving the anomalously high rotational speeds of their outer stars, or else DM doesn't exist at all, and it's all down to the laws of physics needing some adjustment. Assuming Dark Matter does exist: Let's make another leap here and take this same principle for a galaxy and apply it to a single star system. Might that not mean, then, that Dark Matter congregates in the outer reaches of the star system, driving the star system's rotation (and creating that missing angular momentum in the solar system (5))? That Dark Matter might then take on the form of any number of smaller, essentially invisible sub-stellar bodies - like, for instance, a Dark Star at the periphery of the solar system. Is this even necessary anyway? 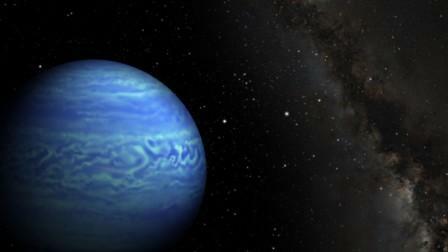 After all, a sub-brown dwarf made of perfectly ordinary matter would suffice just the same. "In photos released from its first science orbit, [Ceres] shows its cratered face and, in a few of those craters, the mysterious white spots NASA scientists have been puzzling over for months. A photo taken May 4 by NASA’s Dawn spacecraft shows the largest to be a number of differentiated white spots that some interpret to be water ice. "Mark Sykes doesn’t think so. Sykes, director and CEO of Tucson-based Planetary Science Institute, says if Ceres held that much ice it would have registered a much stronger signal with NASA’s Herschel Space Telescope. The spots might be minerals left over from evaporated ice, said Sykes, who is a co-investigator on Dawn’s science team. Given the immensity of the areas involved, it does seem likely that we're looking at some kind of unexpected zone of ice, glinting brightly in the sun. Perhaps Ceres is like the Galilean moons and under its surface lies an asteroid-wide frozen ocean. In which case, Ceres would be like an icy billiard ball topped with heavily cratered rocky terrain, and covered in igneous rock and dirt (from previous volcanic outflows?). If so, then the bright lights might be relatively fresh impact areas that have exposed the pristine ice below, which is then highly reflective in sunlight. Perhaps Ceres was itself once a Galilean moon of Jupiter, stripped away from its siblings early on during the solar system's tumultuous history? In some of these images, an object has been spotted moving across the field of view (4). The moving object adds an extra dimension, further heightening speculation that this whole zone of interest may be artificial in origin. 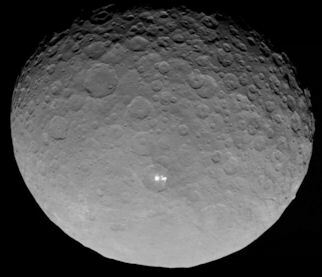 If confirmed, the moving object could well be an undiscovered moon of Ceres. Or, if my hypothesis about a relatively recent impact is correct, then perhaps it's some of the impact debris now orbiting around Ceres. NASA appears to be maintaining an open mind on the issue of the bright spots, and has even opened up a website poll to gauge public opinion about the various proposed solutions to the mystery (5). I've been shown a new paper, being prepared for publication, which demonstrates a missing mass in the solar system (1). The physics behind this is quite complex, although the author in question has done an excellent job of making it as accessible as possible. He has shown that the solar system's angular momentum is inconsistent with established physics. Any argument that this is due to a lack of equilibrium in the overall energy of the system is not borne out by observed facts, leading to a disparity between mass, energy and angular momentum. A truly international team of researchers have observed the movement of a sizeable gas-giant world, orbiting a young red dwarf star (designated HATS-6) some 500 light years away. What makes this discovery special is the fact that this planet seems way too big for its small parent star. 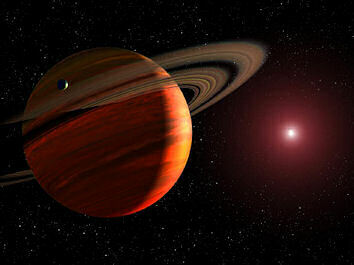 It also lies extremely close to the parent M-dwarf star - a tenth the distance of Mercury to the Sun (1,2). It whizzes around the M-dwarf in just 3.3 days, making little old Mercury appear positively tortoise-like in comparison. Density-wise, this planet is incredibly light. The discovery calls into question standard models of planet formation, none of which is able to predict such a massive gaseous world in such close proximity to a young red dwarf star. There is some speculation that the red dwarf and this super-light gas giant formed together, from the same central part of the revolving proto-stellar nebula, and then separated at birth (5). There is a precedent for this kind of separation, in the form of the rather bizarre Wolf-Rayet stars. These begin life big - initially containing at least 20 times more mass than the sun. But their hydrogen-dominated outer layers soon puff up and are lost, exposing the objects' helium-burning cores to space. Arguments about the mechanism remain unresolved (it's either due to the star's own strong stellar wind driving off the outer hydrogen layers, or their being dragged off by a binary companion) (6). Certainly, this is a very different beast to our tiny M Dwarf HATS-6, but if the binary star ("cosmic cannibalism") mechanism is the correct one, then this may lead to an understanding of how 'hot Jupiters' might form in a more general sense. If outer, hydrogen-rich layers of stars are being drawn off by binary companions, and then if that process is interrupted for some reason (the loss to interstellar space of the binary companion, for instance), a 'hot Jupiter' might result. The Universe's cosmic waters emerged far earlier than has been thought, new research has shown. Even though the abundance of oxygen in the Universe was still very low by today's standards, water could still form in the early molecular clouds at temperatures akin to a warm summer's day (1,2). Water appeared just a billion years into the history of the universe - a finding which has profound implications for the potential early emergence of life in the universe. As we began this blog, the prospects for a monster-sized watery mother world containing everything needed for life (i.e. "Tiamat") seems very reasonable indeed. As long ago as 2001, my research colleagues and I were reporting on on-going efforts by DARPA to create 'morphing metals', mostly in the form of their Compact Hybrid Actuation Program, or CHAP (3). These tiny actuators are mechanical devices which perform an action under the influence of, say, a magnetic field, or electrical stimulation. They could be used to morph the shape of an aeroform in flight, for instance. Even back in 2001, there were hopes that one day scientists would be able to create (re-create?) 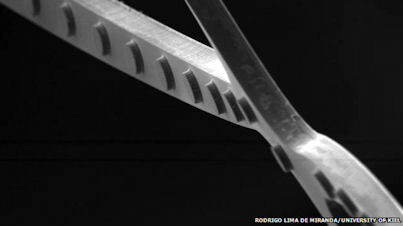 "shape memory alloys" which could autonomously "self-actuate". This new memory metal alloy seems to be a great step forward in this long-standing metallurgical research effort. This sounds more like the Nickel/Titanium/Copper alloy now confirmed as a true, highly resilient memory metal. Sixty Eight years on, has humanity finally mastered the material from the Roswell saucer?